There’s something you should know about me. I love tea. Preferably with biscuits, or cake, but always white with no sugar, and definitely not in a coloured cup because you can’t really see the colour of it properly! Anyway, this is relevant because it helps to explain how I came up with the following description of the way I work. How am I like a delicious cup of tea? I have spent quite a bit of time lately considering and discussing what I do, what label or title I should give myself, how I work, and who I work with. I’ve gone round in circles, I’ve gone forwards and backwards, I’ve been at a complete standstill, I’ve hopped desperately from foot to foot wondering why someone can’t just come and give me the answers (turns out they were inside me anyway), and why I get called a wide range of ‘job titles’ from business manager, consultant, business coach, to mentor, advisor and business buddy. The thing is, I am all of those. Like a delicious and special tea, I’m a unique blend of many different flavours, working together in such a way that the result is whatever you need it to be. Your tea might need to pick you up, calm you down, give you a breather while you think, or just offer refreshment when you feel like it, and while you could choose a different tea depending on what you wanted it to do, there are also special blends that give you the best bits of many – all in one. So here I am, describing my work as a unique blend of consultant, coach, mentor, advisor, manager and buddy, combining all the bits you and your business need, to serve you just the outcome you require. Helping you to brew a better business. Consultancy – I give you practical solutions to specific business issues, based on my wide ranging knowledge on running small businesses, including improvements to operations and strategies. Coaching – I support and guide you in achieving your goal, focusing on specific tasks or objectives, and give the confidence to find the answers for yourself. Mentoring – I share my knowledge and wisdom, and use my experiences to explain the processes and pitfalls of various aspects of your business, also being a role model showing what can be achieved, especially as a working mum. Advice – I give realistic and practical advice on how to make improvements in your business, and the information you need to enable the best decisions to be made or the best solutions to be chosen. I come up with ideas you may not have thought of yet. Business Manager – Using my experience and expertise in all aspects of running a business, I work together with you to help your business run efficiently and grow effectively. Business Bestie – Your business best friend, a buddy, a fellow woman in business who you can turn to for encouragement, a listening ear, and constructive criticism. Someone to bounce ideas off or get an opinion on something if you work alone, or be accountable to when you say you are going to do something. Someone who you can have a cuppa with, moan to about your work, get some honest advice and return to your business with a smile again. You might need a bit of everything, you might need some more of one than the others, but with my unique blend you will get exactly what you need in the way you need it. 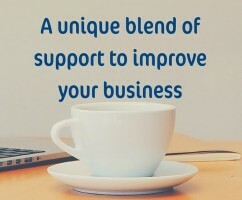 If you feel like you need some help to develop or improve your small business, but just don’t know exactly what or how, book a free call and let’s have a chat and work out the best blend of support for you.